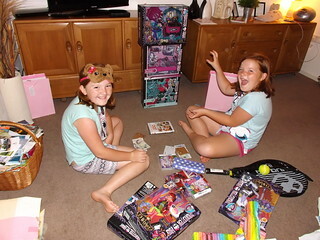 Georgia and Emily's tenth birthday. I was up very early (about four) took pain killers had lots of tea and tried to walk off the pain in my leg but it wasn't long before I was joined by Georgia. 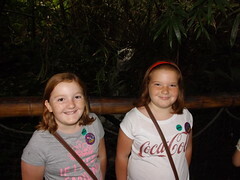 She wanted to know if her and Emily could get up, I said ask Mam and by five everyone was up drinking tea. After opening the presents at five thirty, most of them went back to bed. 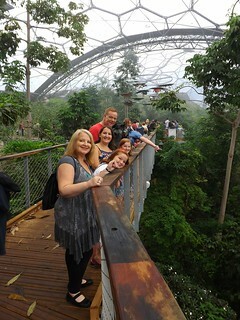 The surprise for their birthday was a visit to the Eden Project, Nicole had used Tesco Vouchers to get cheap tickets. 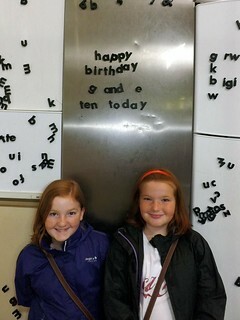 When we arrived it was raining, but there was a bus from the car park to the covered entrance. 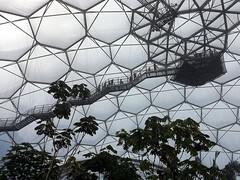 As we already had tickets, there was no queuing and we went straight in, I say straight but it is a long windy path down to the domes, but it had stopped raining. 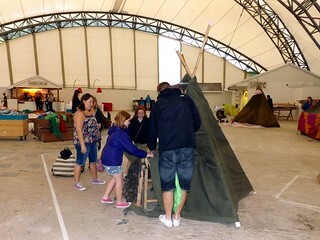 The first dome we came to was the stage, used for music events but today was being used for children's activities. 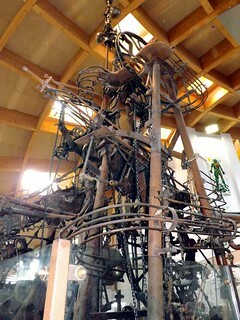 Kids were building, buildings from recycled materials, I say kids but it was mainly grown ups doing most of the work. 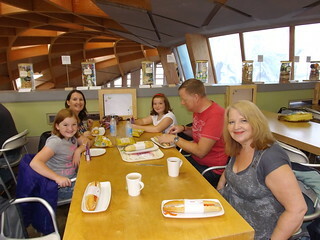 The decision was made to join in and do this as well, before visiting the main domes. 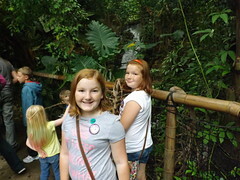 Once the wigwam was dismantled and all of the parts put back in the relevant spots, we headed to the large Tropical Biome, I could tell you all about how it is made and how big it is but it is simpler to link to the Wikipedia entry. What I will tell you is, that it was a whole lot warmer in there and it was busy, very busy. At first the lens on my camera kept steaming up but eventually it it warmed up and I took too many photos of flowers and not enough of the birthday girls. Looking up, some parts of the dome looked like scenes from science fiction films (I think some were filmed there) and there was also the walkway high up in the top, you would never get me up there though. 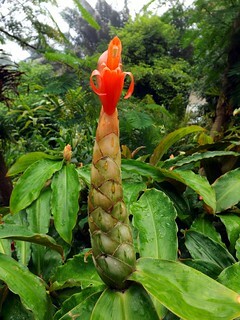 We spent about an hour in the Tropical Biome, before heading off to find some lunch. We didn't fancy the huge food hall, that looked a lot like a German beer hall and was very busy. So we walked to the cafe in the Core, the home of the Seed. 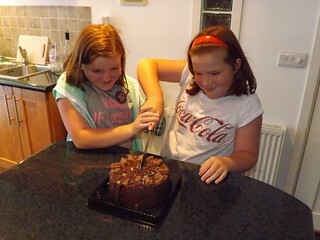 We only wanted a light lunch as we were not sure what we would would be doing for the girls birthday tea. 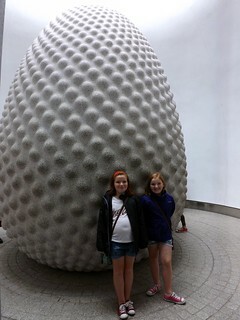 The Core has hands on educational information and a giant sculpture of a seed at its centre. 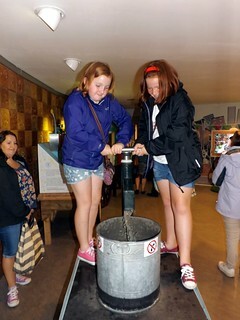 The girls also had a go at pumping water and crushing nuts using a great big machine that looked very Steampunk or Heath Robinson to me. 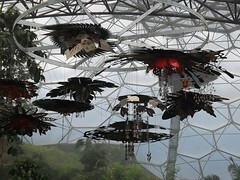 Next we made for the Mediterranean Biome, which I did not find to be very impressive at all but that could be just me. By the time we left there the sun was shining and we had a slow walk back up to the entrance complex to get the bus back to the car parks. I did fine new beers in the gift shop but I figured I could get then cheaper elsewhere. From there we headed to seaside at Fowey, the others had all been there on day two, when the went out for the train tickets, so knew the best place to park. 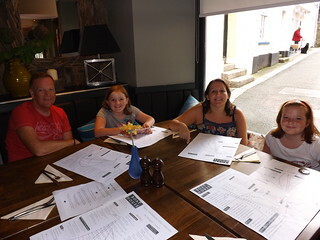 However as we walked along the sea front it started to rain, so we popped into an Italian for an early tea. They were only serving pizzas this early but that suited everyone, the service was very slow and I would not recommend the place to anyone, although the pizzas were quite good. Back at the room there was cake for Georgia and Emily, we all had some.